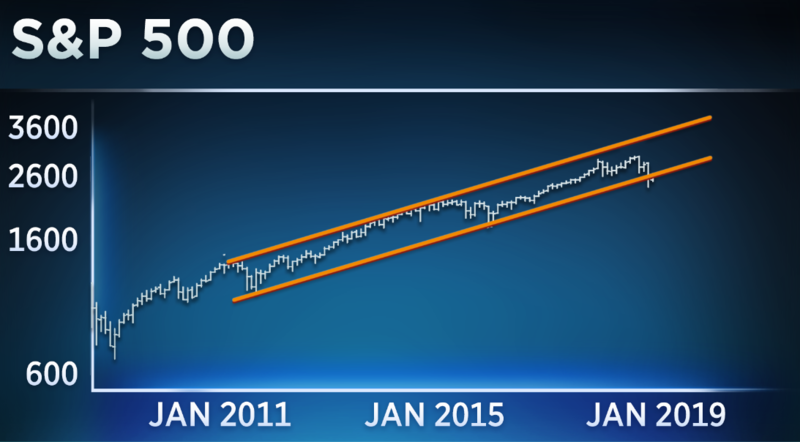 The bull market is at a make-or-break moment, one technical analyst says. Stocks on Tuesday posted the longest daily winning streak since November. 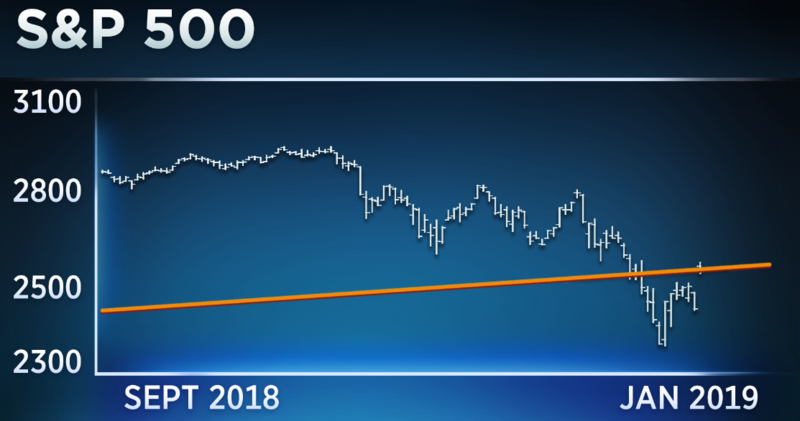 "The S&P is in a very pretty, beautiful, rhythmical, symmetrical uptrend that we've just broken through," TradingAnalysis.com founder Todd Gordon said Tuesday on CNBC's "Trading Nation." After examining the S&P 500 chart, Gordon believes the index is set to climb even higher — provided it can bounce above its current range. "This level right here, at about 2,580 - 2,600 is going to be that break-even point. If we hold this, we could go back and retest lower lows. But if we do pop through here, I think all is clear heading into earnings season," he said. Stocks finished higher on Tuesday after reports that trade tensions with China are easing. After a volatile end to 2018 where market whipsaws became the norm, 2019 has seen less choppy trade thus far. The S&P is on a three-day winning streak and has posted gains in five of the last six trading sessions. If the S&P can't hold above the 2,580 - 2,600 level, however, Gordon believes it could be a dire warning for what's ahead. "If we do fall away from this level I think the last chance is 2,300. If the S&P doesn't hold that level then I think we're in big trouble for 2019," he warned. From a valuation standpoint, S&P Global Portfolio Manager Erin Gibbs believes the S&P can rally 10 percent before the end of the year. "The market hit 14X forward earnings, and that's where it found its low, and that was a big level of support from 2010 until about 2013. And since then, we've bounced back up into the mid-teens, which is where we were for most of the trading for the past five years, with the exception of last year. So right now, it looks pretty healthy," she said. The S&P currently trades at 15 times forward estimates, according to Gibbs. By comparison, the index was trading at 17.37X when the S&P hit an all-time intraday high on Sept. 21. Gibbs believes earnings growth will drive the next leg higher for stocks. Since she foresees price and earnings estimates rising in tandem, she thinks the index will remain at a "very reasonable valuation" within an overall "healthy market." The S&P closed at 2,574 on Tuesday, so a 10 percent gain by the end of the year would bring the index to roughly 2,831, which is below the all-time intraday high level of 2,940.41. So while Gibbs is bullish, she's not expecting outsized returns for the year, noting that "there are a couple of hurdles" that she's not necessarily expecting stocks to surpass since we are in a "lower growth environment."